Cinemax is best known for its Rytmik games but it's got something entirely different lined up for Europe in the next few weeks. Commando: Steel Disaster is an old-fashioned run-and-gun shooter that saw a retail release in North America several years ago, but Cinemax and developer Mana Software are taking another shot at it with a DSiWare release. 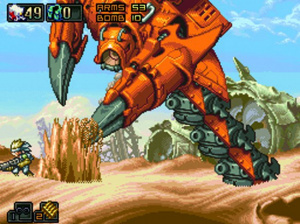 The Metal Slug-like shooter arrives in Europe on 22nd December for 800 Points. Here's the latest trailer to load into your chamber. This looks pretty good... I'll be keeping my eye on this one. That looks like a fun metal slug clone. Seems a bit too slow compared to that game though. Hopefully it will have multiplayer. I'll keep my eye on the game till the review. I already have the cart. Any notable additions that'll make this worth downloading? It looks terribly easy, and the in-game sounds are pretty cheap. Doubt I would get this. Was just informed that Metal Slug Advance is a good buy. Since I can get that for $8, I'm gonna have to pass on this. Just an interesting note, the eShop in Europe has begun undergoing maintenance for the system update. Looks like a pretty shameless ripoff, but that can be forgiven if the game is well-made and fun to play. If this has co op I will buy this. Interesting game but got ruin by not including a multiplaying co-op mode.